Do you get the feeling that some people turn off when you talk? That your voice, as it were, is an auto-filter, turning some people away? As you take more leadership within business, or in life, are you finding you have to speak more? Maybe you’re in a position where you’re trying to spread the word about what you do, or need to engage with more clients and customers, or your team. Now, don’t hate me for this, but, yes, your voice will turn people away from you. It will make some people not want to spend time with you. Your voice will make some people reluctant to trust you, or listen to what you have to say. In extreme cases, it may even make some people not want to spend any time with you at all, least of all work with you on an ongoing basis. There will be some people who just won’t want to spend ten minutes in your company. Your voice may well turn them away from you. I know mine has turned people away from me in life – they think i’m “Posh” and that brings up their belief systems around ‘posh’ people. I’m not, I just have an RP accent … but if you’re going to negatively judge me on that, then that’s just fine, see you later. Our voices are one of the many things that human beings judge each other on. It’s part of our tribal, animal, nature – an instinctive way to know quickly whether or not we belong together. Not that hard to do was it? The way I see it, having an auto-filter, can work in your favour. There are billions of people out there in the world and we can’t get on with all of them. If you are self-employed then you know that you also can’t and don’t want to work with all of them either, anything that is an auto-filter to help you get to the best people for you to work with, is a good thing. If you are employed, then the same could be said – do you really want to work for, or with, people who are going to bypass, or ignore, you because of your voice? ALSO as well as filtering out people who DON’T want to work with you … it also filters in those who DO … if you meet someone from the same area as you – with the same accent maybe … does that connect or repel you? You may well get a client, interview, or job offer because of an automatic connection created by the vocal-auto-filter. I know I’ve made great connections with people because of my voice as much as had others judge against me because of it. However, if you feel your, or other people’s, auto-filter is filtering out opportunities, promotions, clients, or ostracising you from your team – then what can you do about it? How can you turn those negative judgements around? 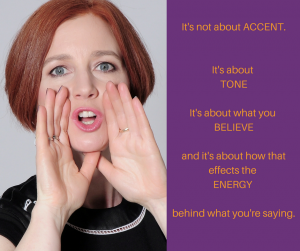 You have a few choices: you can continue in the voice you have, you can change or adapt it, or you can re-connect to who you are and why you’re speaking and discover your whole voice. If you connect to your whole, true, voice – you will start attracting more of the right people and opportunities. Hiding your voice because you don’t like it. Hiding your voice because you don’t want to say things people might not like. Hiding your voice because you believe you don’t belong or fit in with those around you. Hiding your voice because others are louder, more extrovert, take control, or speak over you. Putting on a voice to cover up what you see as your inadequacies or to not let others see your fear or vulnerabilities (you over soften, or over force, your voice). Putting on a voice that you think others want to hear, one that you believe will help you sound ‘better’. Effects of the above can be manifold, you may become monotone, or quiet, too brash and loud, your pitch sits somewhere uncomfortable, you don’t share your ideas or opinions so people stop listening to you, you create nerves which show in your body or voice … the list can go on. 1) Am I working with the people I really want to? Or, Am I in the position I want to be in? 2) What do I want to achieve when I speak, that at the moment I don’t? 3) What do I need to accept about myself to have the courage to speak up? 4) What is the truth behind my real message? Or, What is the passion behind my purpose? 5) Why is it important that I connect with these people? When you know where you are, and why you’re speaking, then speak from that space. In that way, other people then know who they’re dealing with, are more likely to listen and be attracted to you, rather than ignore you, or turn away. So, yes, your voice IS an auto-filter – but you can use it to your advantage. When you are connected to your truth, to your whole-self, when you connect your voice to the rest of your body and to the reason you are speaking – your audience will hear that stronger than anything superficial like an accent, or your nerves. When you speak from your whole truth you will also be more confident that if you’re not getting the results you want it’s because those people, or that situation wasn’t right for you – not because of your voice, because you didn’t speak up, or weren’t voicing your truth. If you could change one thing about your voice, what effect would it have? Let me know in the comments below. Always remember : If in doubt, BREATHE.